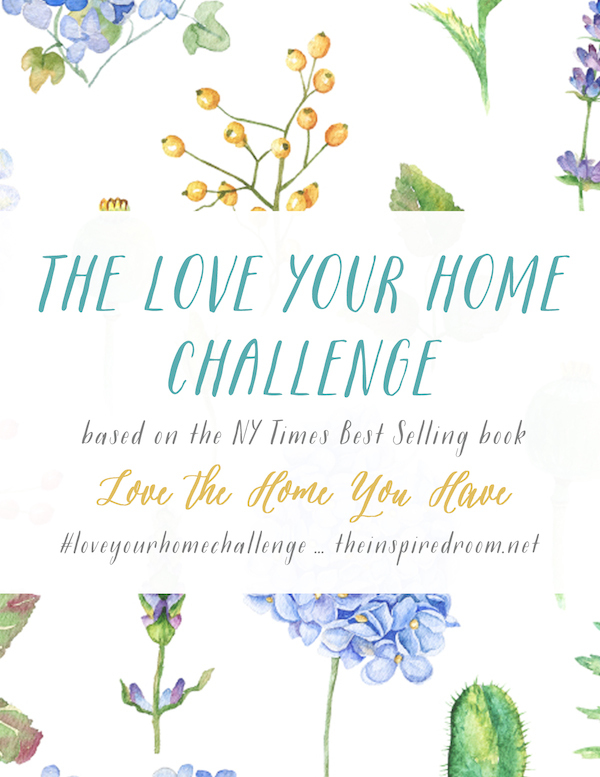 Welcome to The Love Your Home Challenge, Spring 2016! I’m SO excited that you will join me for the next 31 days! I for one cannot wait to get started, so let’s count today as day one! This is going to be fun. 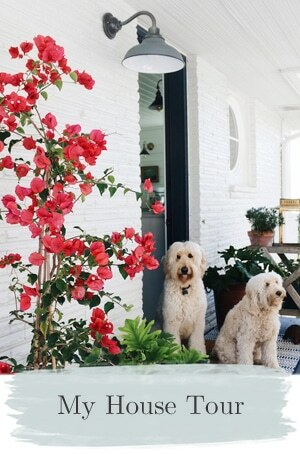 Every home has its shortcomings, but these simple and sweet bite-sized challenges are designed to help you transform small spaces within your home, focus on living with gratitude for what you already have, and rekindle your love for where you live. Every Sunday on the blog I’ll share a list of challenges, one for every day of the week. 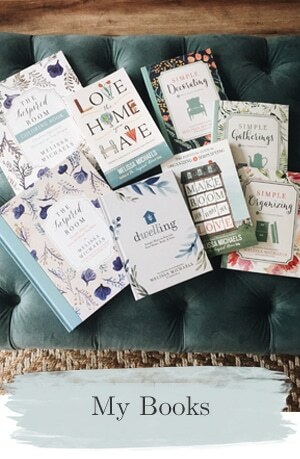 And if you follow me on Instagram (@theinspiredroom), I’ll be posting the challenge there each day so you can see and share as we go. If you share, be sure to use the hashtag #loveyourhomechallenge so I can find you! If you’re not on Instagram, you may also upload a post to my community blog site, Home Love Stories (it’s free to join and you don’t have to have a blog to share your stories! ), or even just leave me a comment here to let me know how things are going! I hope you’ll follow along! I find that making a commitment to simple daily progress around the home is what most effortlessly transforms it and improves how I feel about my surroundings. And if we are all doing these same daily projects together, we can feel more inspired! Below are our first seven days of challenges! Day 1 – Home Gratitude: Today, start a special gratitude journal for The Love Your Home Challenge. Set it out where you’ll see it! Make it a habit to add at least one new note of gratitude for your home every day. Day 2 – Declutter: Pick one drawer to declutter and organize from start to finish. Dump everything out, only put back what you need. Stand back and admire your accomplishment! Day 3 – Less Is More: What surface is your worst clutter magnet? Today, reclaim that space. Clear the surface completely. Clean and polish it. Inspire us with a before and after photo! 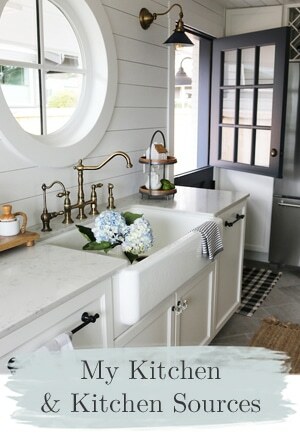 Day 4 – Make It Pretty: Give the kitchen sink area some extra love. Clear dishes and polish up the sink, faucet, and soap dispensers until they are clean and shiny. Wipe off the counters and set a new (or even just clean!) dish towel over the edge of the sink. So pretty! Day 5 – Delight Your Senses: Make your home smell fresh and clean! Throw open a window, toss sheets and towels in the wash, take out the garbage, vacuum the rug and dust your end tables! Light a candle or bake something delicious as the grand finale! Day 6 – Embrace Memories: Go on a treasure hunt to collect photos, ticket stubs, special letters and postcards that have been tucked away. Find a creative way to display or corral things that spark good memories. Make your home a happy place! Day 7 – Your Sanctuary: Give your bedroom a spring refresh! Make the bed, clear the nightstands. Treat yourself to a little something new, or shop your own house for a fresh and creative way to brighten up your room. Have fun and let me know how your week is going! 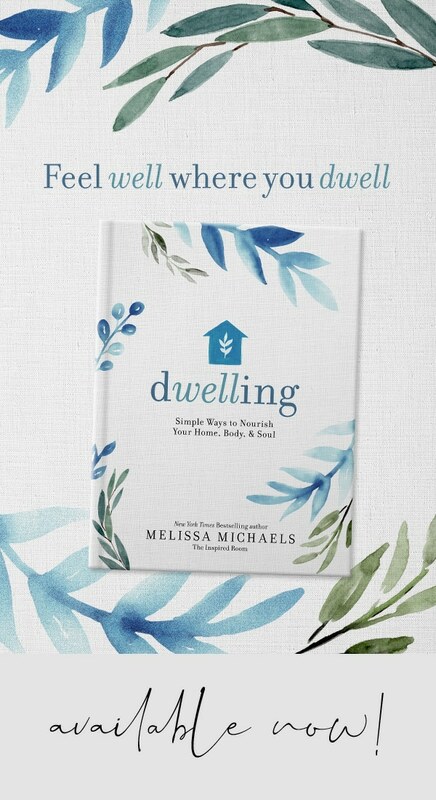 These challenges are adapted from my book, Love the Home You Have. Thank you for these inspirations! I am going to grab this book from the library today as well! 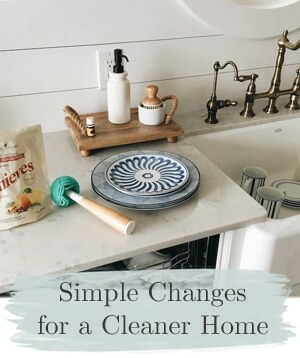 We are in the middle of a bathroom renovation and the dust is killing me so these are some ways I can “clean up” my house in the midst of our chaos! Love this idea! I am joining in the fun! what happened to Jack’s blog? So glad you started this. I started my gratitude on New Year’s day, so I have that all set already! I look forward to starting the challenge! Thanks Melissa! I’m going to try this!! This will be fun. Looking forward to giving our new (to us) house some love, trying to make it feel like ours/home. I’m excited to see how I can make this work for me. Lots of other things going on in my life right now, but I’m inspired to give this challenge a go. Thank you! Great! Each challenge is pretty easy so it’s definitely a good one to do even when you are in a busy season! :) So glad you’ll join us. Today I started my home gratitude journal, entered the date we bought this home, and the way it’s blessed our family already, serving as the launch pad for our adult children. I also labeled a page for each room and outdoor space in our house to note thanks and ideas for updates. Last week I cleared several drawers, so I have momentum for today’s home love challenge. I did manage to (2) declutter my clothes drawers. (3) reduce the amount of clothes in the drawers. Do I REALLY need 10 sets of PJs? (5) I am delighting my senses with essential oils diffuser daily. (6) while cleaning my drawers I found some trinkets to display. (7) my bedroom has always been my sanctuary. Now I must change linens and freshen up. I bought new bright white sheets to hang for the summer as well as new drawer pulls. (4) not done yet. Ran out of time. (1) I love my little place. I’d post pics but there’s no way to post them. 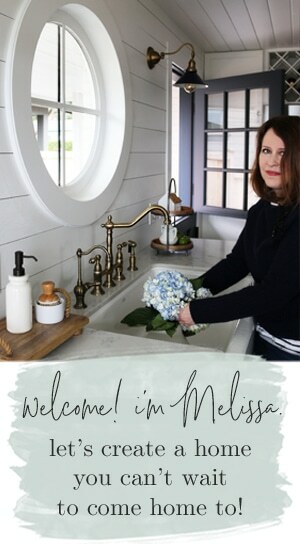 Oh, Melissa, I’d love to do these…but I’m not at home right now because of toxic mold. Maybe I can bookmark these posts for when I get back home. They seem nice and doable! You are the very first blog I have ever read and I’m still following you all these years (well, 5-6) later. I am traveling to the Portland/Seattle area in June with my family. I would love to visit some of these cool places you post about. Can you suggest 2-3 places that are on your ‘must shop’ list? We are there the first two weeks of June. I am inspired to get busy on the home challenge. I will post my progress if I can figure out how! Thanks so much! I’m starting this challenge a little late but it was the perfect time for me to find this! We put our townhome up for sale with the hope that we could purchase a single family home across town. Long story short, our home has had no interest and other homes in the neighborhood are selling too low for us to compete. I really like our townhome but I don’t love it or see it as a “forever” home. However, I made a list of pros and cons for staying in the townhome for the foreseeable future and the pros list is much longer!